We commonly attribute personal significance to objects—an ex-lovers T-shirt, for example—and, for me, some animals and plants possess a similar totemic power, calling to mind a particular emotion or experience. During a short art and writing residency in the Catskills (the Platte Clove Artists-in-Residence, run by the Catskill Center for Conservation and Development, NY), two such species helped me to come to terms with a recent, cross-country move that I hadn’t realized had been so unsettling. On the first afternoon of my residency at Platte Clove, I explored a trail that begins a few steps from the Catskill Center’s cabin porch and makes its way down one of the valley's uppermost gorges to Plattekill Falls. Sunlight filtered through the overstory, unevenly illuminating a forest floor decorated with fallen leaves and eastern hemlock cones. After walking a short while, I paused and closed my eyes so that I could better pick out the varied woodland sounds. I heard the scratched-slate voice of a grey squirrel, as well as the rapping of a woodpecker’s bill on hardwood, the burble and rush of Plattekill Creek, the lilting queries of red-eyed vireos, and the rustle and twitch of an Eastern chipmunk foraging in the litter. When I again opened my eyes, I was surprised to discover the sources of all these sounds were hidden from view, concealed in the canopy or by dense undergrowth. Even the chipmunk, evidently so nearby, remained invisible to me. As a resident of the San Francisco Bay Area for two years, I’d grown accustomed to the trails of California’s North and Central Coasts, which pass through relatively sparse groundcover and are generally more broad than their eastern counterparts—more often than not, if you hear something, you can see it, too. In Platte Clove, though, listening to things I couldn’t see, I finally appreciated why an outdoorsy friend of mine who moved from California to New England was initially so unnerved by her summertime hikes in the Northeast. She wrote to me of Massachusetts’ suffocating woods, describing them as a melange of greens that hungrily closed in around her. I’m not intimidated by thick forests, but I prioritize vision over hearing, and my naturalist’s preoccupation with obtaining assured species IDs had been indulged and bolstered by two years of California outings. Ten minutes into a short hike in the Catskills, and I grudgingly accepted that my residency species list would be sullied with question marks. When I arrived at the trail's end, I discovered four local twenty-somethings cavorting in the waterfall's plunge pool. As they shouted and splashed about, I searched for timber rattlesnakes among the broken slabs of bluestone and wild sarsaparilla that cover the south-facing slope of the ravine. I turned up no snakes, but roused a number of American toads. Along with its cousin, the Fowler’s toad, the American toad is abundant in the eastern United States, but doesn’t occur in the west. Absence makes the heart grow fonder, but it also lets you see anew, and I was delighted to have an opportunity to contemplate the toads as I hadn’t in years. As a young child on Virginia’s Eastern Shore, I routinely captured Fowler’s toads for ogling. One of my earliest experiences of empathy involved such a hostage. Cupping the small, stressed creature in my hands and peering through an opening between my thumbs, I watched the toad’s throat thrum and admired the alabaster skin of its underbody, so finely granulated and damp. I knew by then that toads were considered lowly critters; we associate them with witches, apply their name to people we consider repulsive, and, along with their smooth-skinned anuran kin, insist they need to be redeemed by the kiss of a princess. But there, in my hands, so close to my face that we shared the same air, was proof that the fairy tales had it wrong. The toad was a marvelous and fragile animal, and one that I felt connected to in a way I’d not previously perceived—two organisms, hearts beating, lungs heaving, alive together. I recalled that boyhood encounter as I observed the toads of Plattekill Clove and I felt an upwelling of gratitude and emotion, brought on by the chance to see toads I’d missed more than I’d known. The daylight was reddening and beginning its retreat by the time I returned to the trailhead. An Eastern phoebe chipped at me from its perch on a low-hanging branch near the cabin. Light in color and smallish, I guessed the bird was a female. She pumped her tail and flitted from branch to fence post and back, calling persistently. I offered a few pitiful chip replies and watched her for a minute before heading inside. Half-an-hour later, while I read by a kitchen window in the day’s last light, I heard faint scratching and peeping from the cabin's second floor. Expecting to discover mice, I ascended the steep stairs into a dimly lit, humid room. Before my eyes adjusted, my attention was arrested by a whirring blur just outside the screen of a low-slung window on the cabin's north wall. A bird. It must have heard or seen my movements within, for it disappeared as quickly as it had materialized. Its brief presence, though, gave rise to an urgent chorus of cheeps. Not mice, after all. Once the baby birds quieted, I methodically lowered myself to the floor and inched toward the window screen until my face was about two feet from where I believed the nest was located, on top of the window’s upper frame, just under the cabin’s eave. It wasn’t long before the adult bird returned. It hovered in front of me for a beat, a high-strung throb of wings, then darted up to join its imploring chicks. I recognized it as the Eastern phoebe I'd encountered earlier. Her incessant chipping had likely been an attempt to draw my attention away from her nest's location. I shall try to make plain the bloodiness of killing. [...] All birds eat living flesh at some time in their lives. Consider the cold-eyed thrush, that springy carnivore of lawns, worm stabber, basher to death of snails. We should not sentimentalize his song, and forget the killing that sustains it. One of my father’s favorite maxims is "every day something dies so that I can continue to live." Coarse as that formulation may seem, the statement is universally true; even the most dedicated and conscientious Buddhist is part of this unsentimental reality. But it’s important to remember that the death of a worm, moth, or man is not exactly the end of the line. It’s more of a point along the way. The energy cached in each discrete body—in you, in me, in the toads and the vireos—is inevitably paid forward, passed on via the body's posthumous decomposition or, in the case of the insects the phoebe brought to her nestlings, via predation. My preferred term for this cycle is reconstitution. I think of it as a materialist’s version of the afterlife. The “me”—my sense of self—will be extinguished shortly after I take my final breath, when my heartbeat and blood flow cease. But the energy I’d borrowed during my short life will keep on keeping on until the end of time, ever and again reconstituted. In the summer, dancing butterflies of pretty colors will congregate where I've gone outside to piss in the grass. The glint of tiger yellow or cobalt blue in their beautiful wings may be enhanced by the minerals that they so crave and that my body has declared surplus. And if a nesting phoebe soon grabs one, she is going to profit also—which is a foretaste of the myriad uses that more extensive portions of me will be put to eventually. 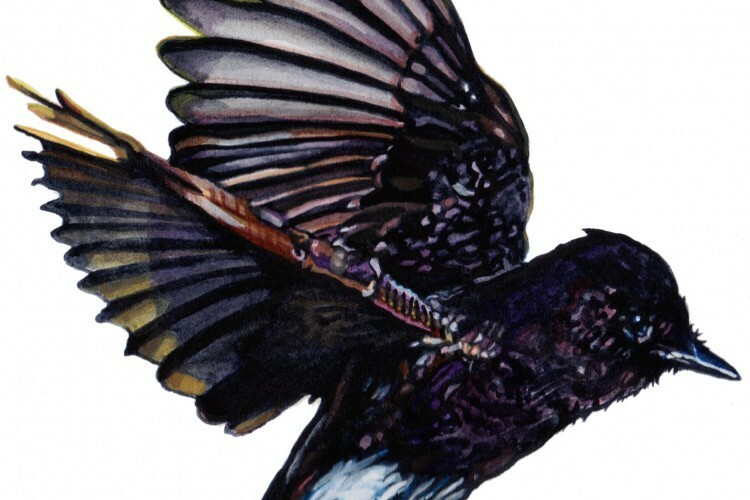 I first read “Natural Light” in the fall of 2000, and the piece took on particular significance for me, so much so that the Eastern phoebe became the principal icon of reconstitution in my personal symbology. A few months after my 2010 move from New York City to San Francisco, I watched a black phoebe, the Eastern phoebe's western cousin, hawking over the surf-sculpted rocks of a Pacific beach. Standing at the edge of the continent, three thousand miles from the Atlantic salt marsh I’d grown up alongside, admiring the western incarnation of an eastern totem animal, I began to fathom the fact that Fowler’s toads, Eastern phoebes, and many other longtime acquaintances would from then on make only irregular appearances in my life. But the black and white bird winging above the waves, at once strange and familiar, allayed some of my unease. It often requires some remove to understand one's emotions. I didn't fully appreciate why the black phoebe was a calming presence until I found myself stretched on the floorboards of the Platte Clove cabin's second story, watching and listening to the Eastern phoebe feed her young. There, it finally occurred to me that my move from east to west was itself a kind of reconstitution. Studying species range maps, I often ponder how animals’ appearances and behaviors are fundamentally informed by their environments, and this is true for the human animal, too. A cross-country move is a radical uprooting, one that requires us to adapt—maybe even to reinvent ourselves—so that we can find a suitable niche in the new habitat. And yet there is also essential continuity, some form or force that keeps on keeping on. I watched the phoebe come and go until it was too dark to see. But I could still hear so much. For more information about the Catskill Center for Conservation & Development’s Platte Clove Artist Residency, visit http://catskillcenter.org/news/2016/1/12/platte-clove-artist-in-residence-program-accepting-applications or contact Katie Palm, Director of Programs for the Catskill Center, at (845) 586-2611or kpalm@catskillcenter.org. Image credits: Christopher Reiger, Platte Clove cabin (Platte Clove Nature Preserve, Catskills, NY, July 2012); Christopher Reiger, Plattekill Falls Trail (Platte Clove Nature Preserve, Catskills, NY, July 2012); Christopher Reiger, Plattekill Falls (Platte Clove Nature Preserve, Catskills, NY, July 2012); Johnida Dockens, "American Toad," Creative Commons license; Henry T. McLin, "Eastern Phoebe in flight," Creative Commons license; Christopher Reiger, Black Phoebe, inkjet print of watercolor painting.